Normally a shallow river, the White Cart Water was prone to flash flooding. Its water levels can rise by six metres after just 12 hours of rain, which threatened vulnerable Glasgow suburbs downstream. 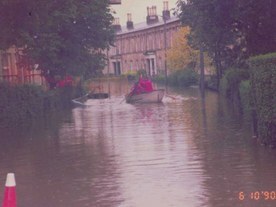 Public awareness of such flooding risks in the 1980s and 1990s, and projections of more intense periods of rainfall made devising a flood prevention scheme a priority for the Glasgow City Council. 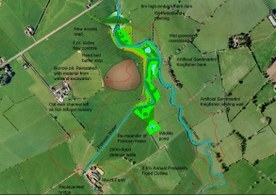 In 2006, the scheme for the White Cart Water and its tributary (the Auldhouse Burn) promoted by the city council in 2004 was approved by the Scottish Government and became Scotland’s largest flood prevention scheme at that time. It includes the construction of three upstream water storage areas outside of the city and a suite of downstream measures within the urban area such as low walls and embankments. Future climate change risks were taken into account and the flexibility of the design of the upper catchment storage areas allows other storage areas to be introduced to redress the balance caused by the effects of climate change in due course. 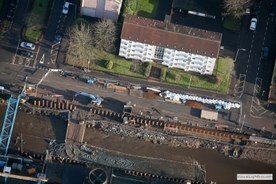 The White Cart Water has inflicted misery to residents and businesses in the south side of Glasgow over many decades. The river is prone to flash flooding. As little as twelve hours of rain can cause water levels to rise by six metres with the potential to turn the river into a raging torrent as it gathers momentum downstream towards the vulnerable suburbs of the city. In the last 100 years there have been more than 20 significant floods caused by relatively minor storms. One of the most memorable was at Hogmanay in 1984 when 500 homes were inundated and millions of pounds of damage caused. Only 12 days later floods inflicted further misery in the same area. In 1990 residents in the area were struck again. In 1994, the river burst its banks once more in various places, and in 1999 families suffered thousands of pounds of damage when the water reached waist height in their homes. Altogether it was estimated that 1,710 residential buildings and 40 businesses are at risk of flooding, although due to the tenemental character of the housing in this area this equates to more than 6,700 homes, with the estimated damage costs being greater than £100 million, at 2008 values, if nothing is done. Existing flood defences along the White Cart Water corridor were piecemeal and isolated. Major investment was required to protect properties not only from current flood risks but also from more frequent inundations expected as a result of global climate change Based on UKCP09 projections, medium emissions scenario and a 2050’s time horizon for Glasgow, there will be an increase in severity of fluvial flooding events (1:100 year event increase to 1:200 year event) and increase in severity of pluvial flooding events (from 1:100 annual to 1:200 annual). The threat of repeated flooding also presented major insurance difficulties for householders, businesses and the local economy. At the end of 2002 the insurance industry withdrew its guarantee of affordable flood insurance in high-risk areas. The industry confirmed it would have to consider charging higher insurance premiums or even refusing flood cover altogether. This could result in property values being greatly reduced. 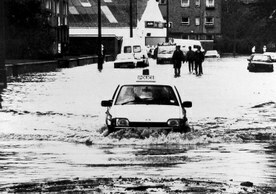 Public awareness of the 1980s and 1990s floods, coupled with increasing awareness that meteorologists project more intense periods of rainfall in future as a result of climate change, made finding the solution for a scheme a major priority for Glasgow City Council. The general effect of the scheme was to mitigate the flooding of residential and business properties in several areas of suburban Glasgow by the White Cart Water and two areas of suburban Glasgow by the Auldhouse Burn (White Cart Water tributary). 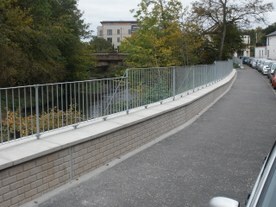 The scheme also included the construction of flood attenuation areas upstream of Glasgow. The scheme was designed to guard against the 1% (one in 100 years) flood event taking into account climate change projections by 2050s, which equates to 0,5% (one in 200 year) flood event based on current situation (data from year 2006); as well as to provide a sustainable, environmentally friendly solution to the flooding problem. A number of studies were carried out since 1984 to determine a suitable flood prevention scheme for the White Cart Water and its tributary to provide protection up to the 1 in 200 year event (corresponding to protection up to 1 in 100 years event by 2050s, according to considered climate change projections). 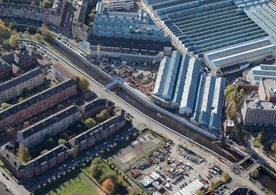 In 2002 the development of the scheme began with the help of consulting engineers. 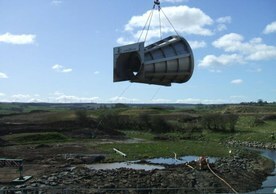 The resulting White Cart Water Flood Prevention scheme, the largest flood protection scheme in Scotland, was published in November 2004 and approved by the Scottish Government in 2006. The scheme is based on the catchment management principle. It combines cutting-edge engineering solutions and natural flood risk management techniques. Central to this is the optimisation of flood water storage in the upper catchment, allowing flood defence walls within the city to be limited to an acceptable height, helping to limit the impact on existing wildlife habitats and avoid creating barriers between the river and the community. The alternative approach would be a 'walls only' solution, which would have resulted in the construction of unacceptably high walls along the urban corridor of the river. The plan involved the construction of three flood storage areas upstream the city to temporarily hold back the bulk of floodwater generated by extreme rainfall, and control the release of water passing downstream through the city to an acceptable level. In all, 33 sites were considered for the construction of the storage reservoirs with dams up to sixteen metres in height; these sites were evaluated for size, topography, geotechnical suitability and the associated environmental impacts. Several of the sites considered were discarded due to significant environmental and geotechnical concerns. Together the three finally constructed flood storage areas have the capability to hold back over 2.6 million cubic metres of flood water and reduce peak river flows by up to 45%. Central to the successful operation of the storage areas was the installation of the world’s largest Hydro-Brake flow control devices into the three dams at each storage area. The Hydro-Brake is designed to enable water to flow unrestricted through it for as long as possible. When the water upstream reaches a pre-determined height in a flood situation, the Hydro-Brake activates and releases water into the river at a controlled rate. The storage sites remain dry for most of the year. During the storm, the temporary storage areas significantly reduce the flow downstream. Nevertheless, this much-reduced flow, combined with the large catchment area downstream of the flood storage areas still pose a threat and be capable of causing flooding in Glasgow. For this reason, flood defences, in the form of low walls and embankments, were also constructed in selected parts of the river corridor through the city of the total length of 7.6km. These works also gave opportunities for environmental enhancement along the river corridor and around the storage sites. The central concrete culverts, which contain the Hydro-Brakes, were encapsulated by large earth dams, which were constructed mainly using site-won material, which significantly limited the need for heavy lorry journeys to transport 180,000 cubic metres of material. Rather than leave the concrete structures of the spillways for these reservoirs exposed, as they are unlikely to be used, they were in-filled with sacrificial material (soil). Grass cover was established to ensure the dams blend with the existing landscape. These spillways would only be deployed if 1:200 year flooding event happened, in which case the force of released water would flush it out. The dams and culverts have been designed to ensure they do not prevent the movement of fish and mammals upstream and downstream. The base of the culverts incorporates baffles and boulders to ensure a varied flow pattern and to retain a minimum depth of water for fish passage in low flows. In addition, there are no hydraulic drops, with the base of the culvert laid at the same gradient as the original river bed. Mammal ledges have also been provided throughout the length of the culvert and ongoing monitoring has shown these are being used by otters at all three sites. Moreover, the flood storage areas were seen as an opportunity to enhance biodiversity through the creation of artificial wildlife habitats: woodland with 6,000 newly planted trees, scrub, and over 90,000 square metres of species-rich wet grasslands, shallow scrapes and ponds. Similarly, within the city re-development of an existing park, embellishment of gardens and allotments was undertaken. Also, artificial habitats for birds, bats and otters were created and 1,000 trees were planted. The developments likewise contributed to the improvement of green recreational spaces. Glasgow City Council recognised the importance of involving the main stakeholders in progressing the scheme. A Steering Group and working groups were established to help develop the scheme, allowing local authorities in the upper catchment and environmental agencies to have input to the scheme from the early stages through to its final form. This proved to be a vital factor ensuring that planning and environmental constraints were identified at an early stage. It also ensured that opportunities for environmental, development and recreational benefits were considered, as well as mitigation of climate change was built into the project. 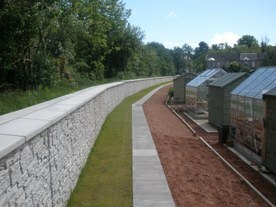 The development of engineering designs for the scheme were complemented by the creation of an Environmental Working Group (EWG) comprising stakeholders from the Scottish Environment Protection Agency, Scottish Natural Heritage, Scottish Water, local angling/fisheries groups and the Royal Society for the Protection of Birds as well as environmental professionals from the three local authorities involved (Glasgow City Council, East Renfrewshire Council and South Lanarkshire Council). The work of the EWG helped to minimise the environmental impact of the scheme, and, where possible, to enhance the natural environment, thus assisting in developing a sustainable flood prevention scheme. Consultation was a key aspect of the scheme development and the selection of the final three flood storage areas. Through one-to-one discussions and an extensive public exhibition, the views and opinions of affected parties were gathered and, where possible, incorporated within the design. The public were kept fully informed about the development and progress of the project through the distribution of regular newsletters and the creation of a dedicated website. Despite the size and scope of the project, only limited objections were received, all of which were subsequently resolved through discussion without the need for a Public Local Inquiry. The detailed stakeholder engagement process ran for a little over two years prior to the submission of the Scheme and was continued to a lesser extent during the time the Scheme was under consideration by the Scottish Ministers which was another eighteen months. A full-time liaison officer was appointed early in the project to manage stakeholder involvement and remained involved through to the completion of the construction works; this led to a very low number of objections raised by stakeholders. The cooperation and collaboration between surrounding local authorities and the project team was critical to ensuring the smooth passage of the project through the statutory approval processes. The presence of many underground services, the close proximity of existing buildings, invasive species (including Japanese knotweed and giant hogweed) and limited access made the design and subsequent construction of the urban flood defences a significant challenge. The form of construction adopted considered these and other constraints and sought to achieve the most appropriate solution. In many areas, the only access to construct the flood defences was from the river stream. Where this was required temporary rock haul roads and working platforms were constructed in within the river. The construction works were carried out in two separate contracts between 2008 and 2011 with the total contracts value amounting to £53 million (EUR 63 million). The flood defences on the White Cart Water at Cathcart were backed by an 80 per cent grant of £40 million from the Scottish Government. The Scottish Government had a scheme in place where they would provide funding equivalent to 80% of capital flood risk management works. The predicted risk of flooding was estimated to be reduced to less than 1% (including future climate change effects at 2050s), which equates to less than 0.5% risk based on current situation. The installed flood protection measures proved to be effective in averting millions of flood damage early on – even before and right after the completion of works. On 4 February 2011, a one in ten year flood event (10% annual exceedance probability) was significantly reduced in impact, principally as a result of the flood storage areas being hydraulically complete, and it is estimated that between £1 million and £3 million of damage was averted. On 29 November 2011, an even larger flood event occurred. This event occurred shortly after completion of the scheme and some 231 properties avoided flooding, corresponding to a saved cost of £12 million. Post-event analysis has shown the scheme to be performing as expected with model predictions closely matching observed data. The key legal instrument is the “scheme” itself which was promoted under the Flood Prevention (Scotland) Act 1961. This gave the Council the right to access property to undertake the works defined by the scheme within certain defined dimensional limits. While the scheme provided the legal framework, to undertake the works all other requirements regarding planning and environmental legislation had to be met and all specific permissions, licences and/or authorisations needed to carry out the works had to be obtained. As the watercourses provide the boundary between different local authorities, a total of 14 separate planning applications had to be made. Two of the dam structures were bisected by the boundary between local authorities and required one part of the dam to be covered by a planning application made in one local authority and the other part in another. These had to be carefully managed and co-ordinated. Moreover, the legislation surrounding the management of the dams required the legal responsibility for a dam split by a boundary to be held by one local authority. Co-operation between the involved local authorities made this possible. The collaborative nature of the process between all the involved local authorities and other stakeholders enabled to address issues before they became potential legal hurdles that could have stopped the process or resulted in a Public Local Inquiry or being called for scrutiny by the Scottish Government Ministers. This was key to the successful delivery of the project. The flood prevention scheme was promoted by Glasgow City Council in 2004 and approved by the Scottish Government in 2006. Construction of the upper catchment flood storage areas and the urban defences was carried out in two separate contracts, which ran concurrently, between 2008 and 2011. The works were completed in 2011. An additional 3 km of urban defence wall will be constructed by summer 2019, under the Clyde and Loch Lomond local Flood Risk Management Plan. This will further improve flood defences, protecting other areas in the city region. The design life of the physical works is 120 years. Covenant of Mayors for Climate and Energy: Sustainable, Climate-Resilient and Vibrant Cities Good practices from Covenant of Mayors signatories.